Richard Dawkins was first catapulted to fame with his iconic work The Selfish Gene, which he followed with a string of bestselling books. Part one of his autobiography, An Appetite for Wonder, was published in 2013. Dawkins is a Fellow of both the Royal Society and the Royal Society of Literature. He is the recipient of numerous honours and awards, including the Royal Society of Literature Award (1987), the Michael Faraday Award of the Royal Society (1990), the International Cosmos Prize for Achievement in Human Science (1997), the Kistler Prize (2001), the Shakespeare Prize (2005), the Lewis Thomas Prize for Writing about Science (2006), the Galaxy British Book Awards Author of the Year Award (2007), the Deschner Prize (2007) and the Nierenberg Prize for Science in the Public Interest (2009). He retired from his position as Charles Simonyi Professor for the Public Understanding of Science at Oxford University in 2008 and remains a Fellow of New College. In 2012, scientists studying fish in Sri Lanka created Dawkinsia as a new genus name, in recognition of his contribution to the public understanding of evolutionary science. 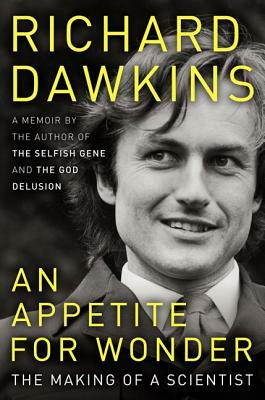 In the same year, Richard Dawkins appeared in the BBC Four television series Beautiful Minds, revealing how he came to write The Selfish Gene and speaking about some of the events covered in this autobiography. In 2013, Dawkins was voted the world's top thinker in Prospect magazine's poll of over 10,000 readers from over 100 countries.